I’ve written a simple init script for openvswitch which uses ovs-ctl script. I’ve saved it as /etc/init.d/ovswitch and I’ve configured it to start automatically with chkconfig ovswitch on. # config="<path to major config file>"
Okay, once I installed CentOS 6.3 in my N40L, it’s time to prepare the tools for my virtual lab environment. 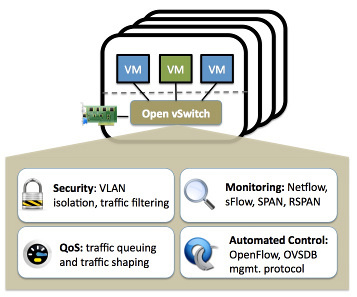 I’m willing to test openvswitch so I read the documentation from the project’s webpage. First of all, check if the bridge kernel module is loaded with “lsmod | grep bridge”, it it’s loaded remove it with “rmmod bridge”. Warning #1: I tried to build the latest release (1.7.1 at the time of writing) and the long-term support release with no success. Compilation failed, complaining about skb_frag_page() was redefined, and here you can find the problem with Red Hat / CentOS 6.3. I had to use the source code from their git repository. I’ve recently unpacked my HP N40L Microserver and, as always, I’m a happy HP customer. I’m going to use this low cost server to build my own lab and I’ll write in this blog about my experiences and tests. This is the first post, so maybe you’ll find this information useful. My HP N40L came with 2 GB of DDR3 ECC RAM Memory. I purchased a Kingston non-ECC 4 GB RAM module and… now I have 6 GB. I know, I know, I would not mix ECC and non-ECC RAM in a production environment, and yes!, it’s a better idea to use the same memory size in both memory banks to improve performance, but… non-ECC RAM was cheaper :-D.